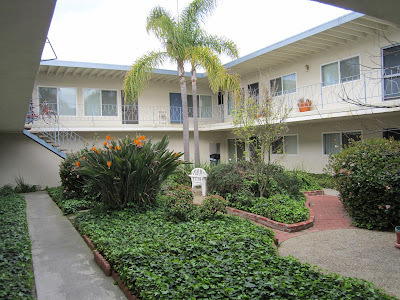 Last month I posted an entry on the blog about the Tahiti Apartments in Torrance, California. 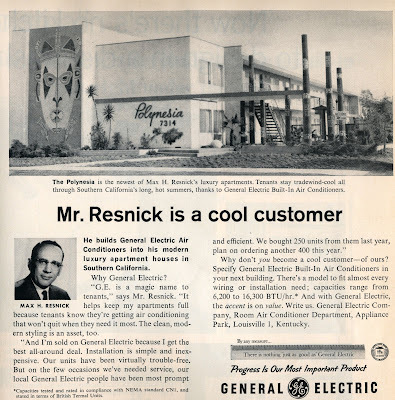 When the complex opened in 1961, the advertising indicated that the interior of the complex was also decorated in a South Seas theme. 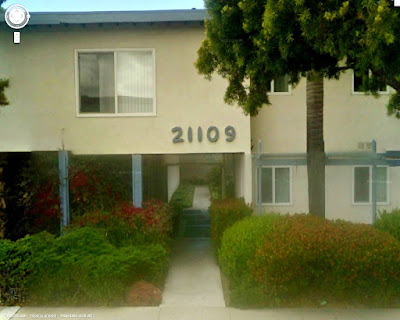 Last weekend, my friend Boris, a local Southern California tikiphile, visited the Tahiti apartments to investigate the current state of the complex. The Tahiti Apartments (March 2012). The two 10' entrance tikis have long since rotted away. No trace of the tikis or Samoan canoe that once existed here. The pool has even been filled in and planted over. Thanks for your urban archelogy expedition Boris! I'm on the road again, and this week I found myself in San Diego, my favorite tiki town. I had the chance to stop in last night and enjoy a few Mr. Bali Hai Mai Tais at the Bali Hai Restaurant on Shelter Island. This was my first visit back to the Bali Hai after the remodel a few years back, and I was pleasantly surprised with the nice job they did updating the place. 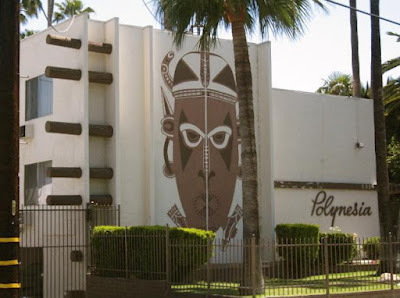 On occassion, I get emails from readers asking me if I have a favorite building, or if I can point out a prime example of Polynesian Pop Architecture. My immediate answer is yes, I have a favorite and I got to visit her again today, lovely as ever. The Crow's Nest exhibits several different classic elements of tiki architecture. 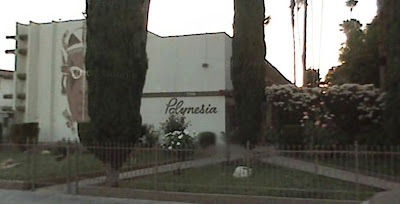 I love this building, its got a great color scheme, it has a shake shingle roof, it has tropical landscaping, its small and intimate, its located on the ocean and finally it is surrounded by other Polynesian Pop Architecture found all across Shelter Island. The year was 1961 and the race for tomorrow had begun. 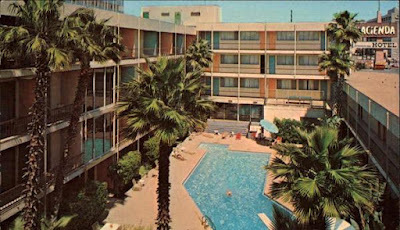 Billed as 'California's First Jet Age Hotel' the Thunderbird International Hotel was built at 525 Sepulveda Boulevard, in El Segundo, California, just a few blocks south of Los Angeles International Airport. The Thinderbird was a sleek modern conference and hotel facility with a restaurant and attached Coffee Shop (seen in the lower right hand corner with the vertical glass windows). The Polynesian Pop craze was at at its peak in the early 1960's in Southern California, and not wanting to be left out, the Thunderbird's Coffe Shop was renovated into The Huki Lau and reopened in August 1962, just one year after the restaurant originally opened. 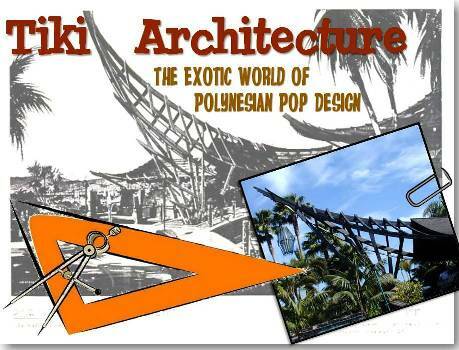 The concept had a 2-story soaring A-frame over the entrance flanked with 3-story gas burning tiki torches. The folks standing in the middle of the A-frame give a sense of scale to the place. What a beautiful drawing. 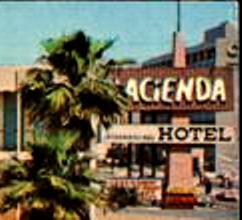 Just a few short years after the Thunderbird opened for business, it was sold to a new ownership group and the facility was renamed the Hacienda Hotel. 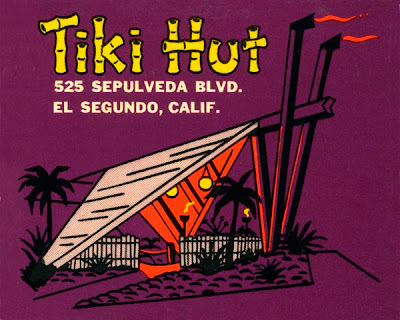 When the new ownership dropped the Thunderbird name in favor of the Hacienda, they also changed the name of the Polynesian restaurant and dropped Huki Lau for the more generic Tiki Hut. 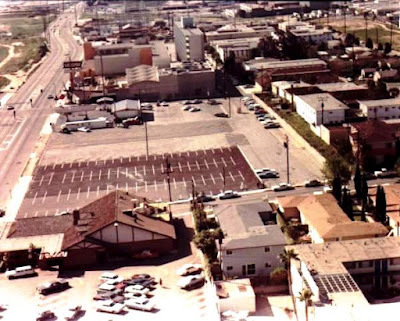 Real pictures of the Huki Lau/Tiki Hut are difficult to find, the best I have come across is this aerial photo looking south down Sepulveda Blvd. 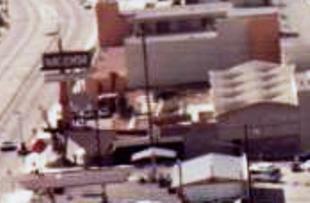 You can make out the Hacienda Hotel with its tower and other buildings in the upper right corner of the photo. The hotel's signage is clearly visible out in front. 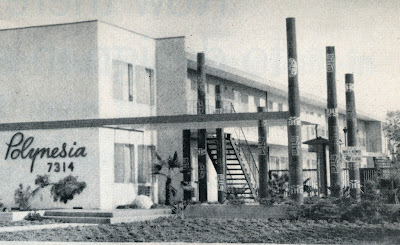 Just in front of the Hacienda sign, you can make out the A-frame and tiki torches (tipping towards Sepulveda) of the Huki Lau/Tiki Hut. 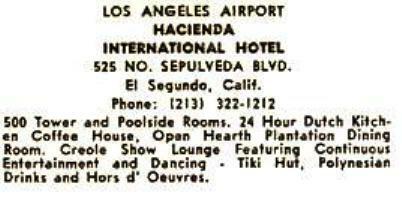 The Hacienda Hotel is still open for business, but has been remodeled and no traces remain of the Huki Lau/Tiki Hut. 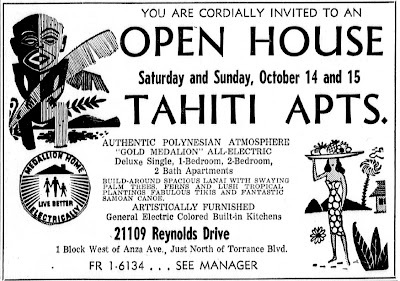 The Tahiti Apartments opened their doors for business on Saturday, October 14, 1961 in the SouthBay suburb of Torrance. Did you note the description of the interior courtyard?...Sounds like a great place to live. 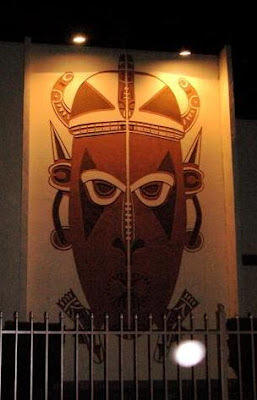 Wow, these apartments were pre-decorated with tikis inside and out! 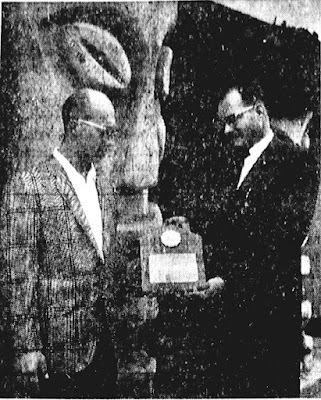 Gilbert Sellan (left), prominent Southern California builder, is presented with a Gold Medallion plaque, as evidence that his new ‘Tahiti’ apartment building meets high standards of the electric industry. Check out those two large tikis in the background. Directly behind Mr. Sellan (striped sport coat) stands a 10 foot tiki. Over the left shoulder of the representative of Southern California Edison you can see another 10 foot tiki with a ‘rootball’ headdress. The eyes of the tiki are just above his shoulder and the nose, mouth and base continue down his back and legs. 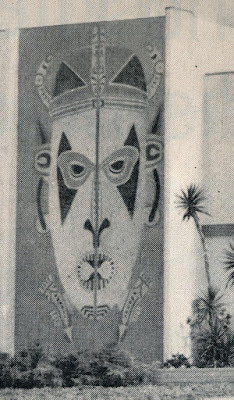 Those are fantastic tikis and made quite and entrance to the ‘Tahiti’! Torrance and the SouthBay area of Los Angeles was a hotbed of tiki activity in the 1960s. 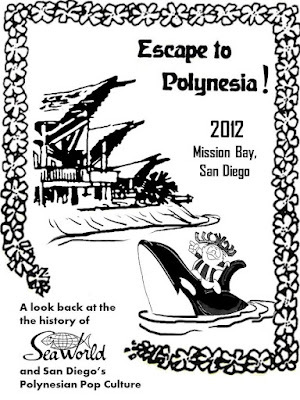 If you lived at the Tahiti, you could have stopped in at the Tiki Kai in Lawndale for dinner (just 3 miles north) and then visited the Polynesian in Torrance for after dinner cocktails (just 2.5 miles south). Both the Tiki Kai and the Polynesian featured live nightly entertainment, ….ahh, that would have been the life of a swinging bachelor! 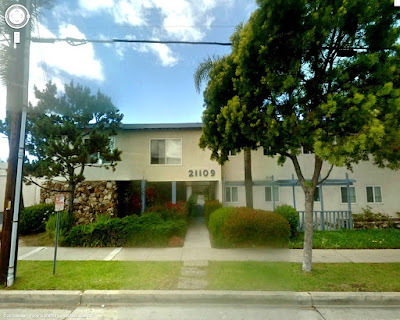 Here is a Google StreetView picture of the Tahiti Apartments taken June 2011. The ‘Tahiti’ name has long since been removed from the building, but the font style of the address looks like it may provide a clue as to what it may have looked like. The two 10-foot entrance tikis are long gone from this 50 year old complex, but I wonder if there is still anything thing hiding inside of that courtyard, there used to be??? Any Southern California tikiphiles up for some urban archeology, drop me a photograph if you find anything. 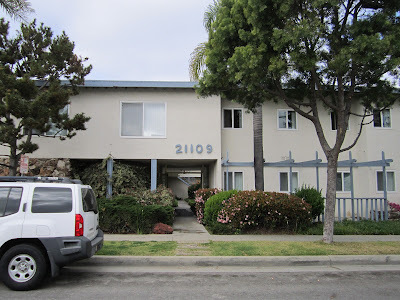 Tahiti Apartments (1961) – 21109 Reynolds Drive, Torrance, California. Update (March 2012) - Link to a follow-up post with new pictures. The location of the mystery tikis has been verified. Chris Jepsen went back to visit the Hana Kiki Garden Apartments and they are in fact the correct location of the original 1961 photograph. You can read about his recent visit and see his before and after photos over on his blog.